I broke my shopping ban. I know. I know. Shameful. I fell in love with this dress when I saw it the other day... Perfect for summertime. It's actually really light so is cool and comfortable. 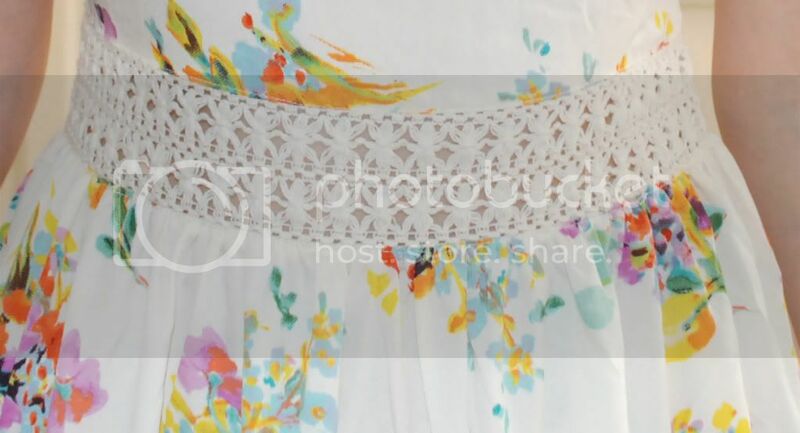 I love the crochet detail on the waistband and near the edge of the dress. It's really subtle so it's great to wear during the day. The colour splashes are also great, as it makes it more summery and a bit more 'adventurous'. The only thing I would say is that it's very floaty, and therefore is absolutely terrible when it's windy outside. Luckily, I wore shorts underneath, else I would have flashed quite a few times today. Today has been pretty chilled out - enjoying the weather at my brother's house and playing with my baby niece in the garden. She just makes me smile all the time and forget all my problems. But now? I'm home alone, bored, wishing I had something to do. Then again, it does give me the excuse of sitting back and watching Eurovision... It's terrible but I love it. Shame on you... Ha ha. But the dress is rather nice all the same. How many days had you left to go?